One of two companion prints to "Whistlers Cove" this study demanded to be drawn. 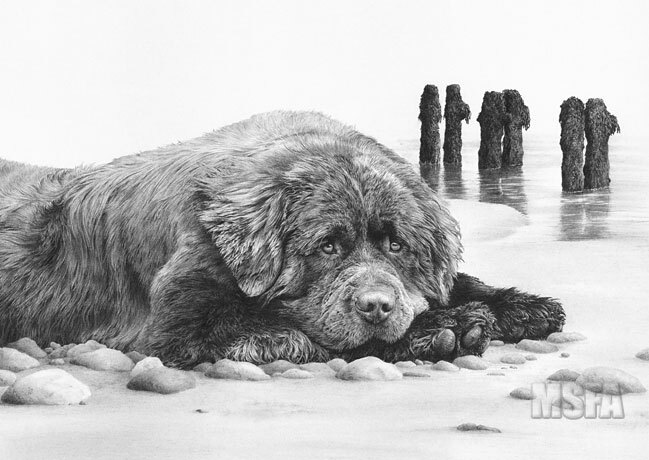 During the sunny afternoon I spent with four beautiful Newfoundlands I noticed one often laying with his head on his paws and I just couldn't resist the temptation to draw it. The stumps are based on an old broken groin seen on the east coast at Sands End beach. The original drawing took 43 hours to complete and is still available for purchase.